"Secrets to the Most Memorable Field Trip Ever"
How many times have you wanted to organize a fun field trip and didn't know where to start? Or worse yet, planned one that flopped! There are a number of things you need to know before planning any successful field trip. Even little things can turn a mediocre trip into one that everyone will talk about for months! "Field Trips - 7 Steps to Fun & Adventure” details everything my family and I have learned through our 22 years of planning fun and educational field trips. We have written this book with you in mind. This step-by-step information resource guides you in organizing the most memorable field trip that your family has taken. For anyone planning any kind of field trip, your book should be required reading before everyone heads out for their adventure. For Planning a Successful Field Trip? During our twenty years of homeschooling we've been on scores of field trips. Most were fun, some were not. Our experience teaches you how to plan a fun trip while avoiding the mistakes we made. Find out just how easy planning a field trip is using this simple step-by-step process. It took us 6 months to plan and organize this e-Book for you and your family. "You Won't Find Anything Like It Out There"
You don't have to try and re-invent the wheel or go through the same learning curve we did to have a fun-filled field trip. We've already done that for you in this 38-page, step-by-step guide. Get the confidence you need to organize a fun successful field trip. Everything is covered in 7 simple steps. a Field Trip? Discover Why Field Trips Are a Necessary Part of Your Homeschool Education. Learn How to Pick the Best Place to Go. There is a Time and Place for Everything, Including Field Trips. A List of Areas to Visit by Subject Are Alphabetically Indexed in the Appendix. Discover Four Secrets to Getting the Most Out of Your Field Trip. Decide When to Go and Plan Accordingly. Exactly How Do You Intend to Get There? All That Important Information to Share With Others. Having Everything on One Sheet Makes it Simple and Clear to Everyone Contemplating Attending With You. Don't Plan a Great Trip and Get There Only to Find Out You Forgot Something. Be Prepared; What Should Everyone Bring Along? Start Your List. the Trip More Memorable and Educational. I love this e-book! It is very clear and easy to read. Very helpful information and I love the humor that shines through. You have done a wonderful job. A checklist conveniently organized by sections. Each section details what to do before, during, and after the trip. meeting will be sure to join the Field Trip you planned! to do is provide their child's emergency information. These two pages give detailed instructions for the parents and students to follow before the trip, on the bus, and during the Field Trip. Congratulations Whyms family for this informative and systematically presented e-book on field trips! The book is really easy to read, while being full of practical ideas and suggestions. I had to smile because I am sure many of the ideas came from actual experiences, especially the cautionary ones. I really appreciate how functionality is a thread throughout the book, with career exploration being a part of it. Too many young adults get to the stage of transitioning out of school without any clue about what they might like to do for a living. I also really appreciated the inclusion of ideas for children with special needs - so often not adequately considered when field trips are planned. Often children with special needs are excluded from activities and field trips because no one has had the forethought to think through the "how" on including them. I guess that the Whyms' family's actual experience with the deafblind camp, and other similar experiences may have something to do with the inclusion of this information. hope you keep this work going! Spend 100's of $$ arranging field trips over the next 22 years. Waste countless hours getting other homeschoolers' experiences. Search the web for just a portion of what you get in this book. Make it easy and download right now! Although this book normally sells for $22.95, for a limited time you can get it for FREE! Free when you sign up for our Newsletter ! What is keeping you from planning your own successful field trip? This book is loaded with proven strategies, tips, and experience you won't find anywhere else! We're certain the information in this guide will provide you with much more than that. As you begin using these guidelines, field trip planning becomes a pleasure. There has never been a better time than now to access this wealth of information. Contact Me from the site to learn how you can get your copy for free. Once you have your eBook you'll be able to start learning new success strategies, tips, and secrets within minutes. It is very interesting and insightful. I would recommend this to teachers, homeschoolers, and also parents in general. This book not only gave me good information on things for field trips, but for vacations, too! My favorite chapter would have to be number seven, "Wrap-up!" There were so many great ideas about things to do after being on a trip. I also liked the idea of scoping it out ahead of time. There have been so many times my family and I went somewhere and it ended up being a disappointment and a waste of money. Another good point was to not bring any valuables. I always leave my jewelry, even my wedding rings home, safe and secure. But, there have been a lot of times where I have been with someone who has lost something dear to them. Something else I have never thought about before was bringing forms for other children. There have been so many times I took friends' children to places, without knowing if they had any allergies to anything in case of an emergency. I loved the Sherlock Holmes game idea. That would be great for long car trips. The Folk Fair sounds awesome and something my family and I would love to do in the future! It would be great to visit Spain without leaving the country! Thank you so much, this book has given me many ideas for the future! 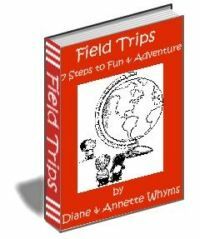 "Field Trips - 7 Steps to Fun and Adventure"
GET OUR BOOK RISK FREE! We're so sure that you will be happy with our eBook, we're including a No-Questions-Asked Guarantee. Your eBook purchase is 100% safe and secure - and Completely Risk-Free. on your next exciting field trip!